Kate recycles Hobbs coat for royal tour | HELLO! September 28, 2016 - 15:27 BST hellomagazine.com The Duchess of Cambridge waved to fans while wrapped up against the chilly weather in a emerald green Hobbs trench coat. 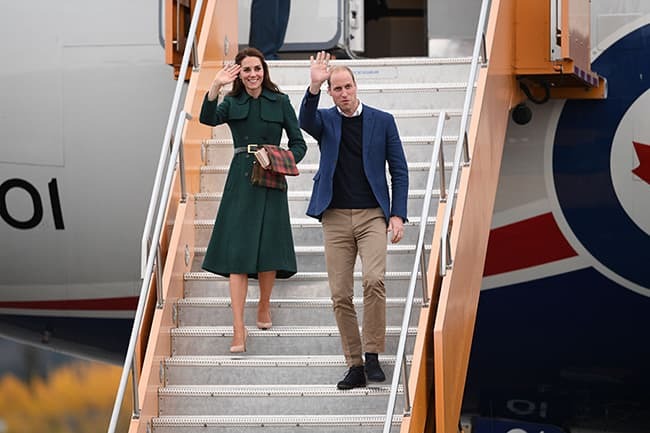 Duchess of Cambridge, née Kate Middleton, recycled a much loved emerald green trench coat for her arrival in Yukon, stepping off the aeroplane with Prince William dressed warmly against the chilly weather while waving to the crowd who had gathered to greet them. The royal looked effortlessly stylish in the Hobbs 'Persephone' trench coat, which she first wore to a St Patrick's Day Parade in Aldershot back in 2014. She accompanied the coat, which originally retailed at £279, with simple cream heels and a maple leaf tartan scarf which she carried neatly over one arm while keeping her brunette tresses long and pinned back. Meanwhile, Prince William looked handsome in beige trousers with a navy jumper and jacket. The pair chatted with the Canadian Rangers and junior rangers upon leaving the aeroplane, where Kate was handed a bouquet of roses, before departing the airport to travel to their next official engagement at the Kwanlin Dun Cultural Centre, where they will view a showcase of Yukon's performing arts. Kate wrapped up for the evening weather after spending the day in Kelowna, where all eyes were on the mother-of-two as she visited the Okanagan Campus of the University of British Columbia dressed in a stunning £2,150 emerald green Dolce & Gabbana dress. The couple will be spending their only stay away from their two children during their trip to Yukon, and it was revealed that they plan to stay in the three star hotel Coat High Country Inn while Prince George and Princess Charlotte would remain at the Government House in Victoria. The little Prince and Princess will be cared for by their nanny, Maria Teresa Turrion Borrallo, who accompanied the family to Canada. Kate is known for her faultless sense of style, and has worn several incredible outfits during the royal tour so far, with perhaps the most memorable being a stunning red gown by British brand Finella. The midi dress, which retails at £1000, was worn by the Duchess for a glamorous evening at the Government House, which the royal accessorised with the Queen's own maple leaf brooch as a nod to her hosts.